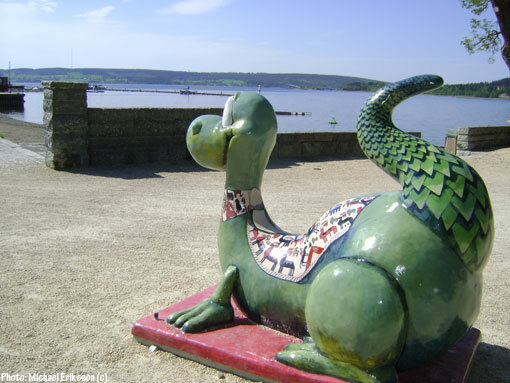 Here is a snapshot of a Great Lake Monster recently placed down by the harbor in Östersund, one of 20 painted in different colours and ways that tourists and locals can see all over town this season. It is in fact financed by local authorities and the model for the monster in question is a childrens book character called Birger that is very popular over here among the very young. Within a week or two now, this harbor will be jam packed with boats. The holidays are coming up and in the next three to four months thousands of tourists will invade this area. Some, perhaps, with hopes to see a glimpse of the real Great Lake Monster, that is sighted and reported every single year in local media. Let us see what 2013 has in store. I saw Michael Schenker and band yesterday at Tonhallen in Sundsvall, performing a solid set of classics and a couple of brand new tracks (from a yet to be released album), and I have to say that it was highly entertaining. I had never seen Michael Schenker perform live in the past (which I can´t quite believe), so it was about time. On this tour he travels with the old rhythm section of Scorpions and ex-Rainbow singer Doogie White. White is at home here I think, and sings better than ever. This gives Schenker a boost and I hope this will be the beginning of a long partnership. The general feeling in the crowd after the show seemed to be that fans were very happy. I was, I thought they delivered a well executed show. Some songs stood out, Scorpions old “Holiday” was beautiful, rockers like “Armed And Ready” (MSG) and “Doctor Doctor” (UFO) almost took the roof off the place. And Schenker played really well and looked like a happy man. Now, can we have more of the same please? Batman always had the coolest car. 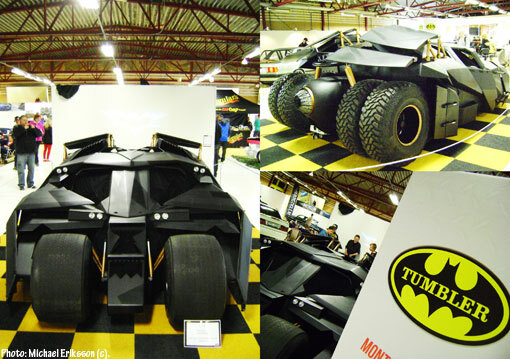 I visited a Car Exhibition in Östersund today to check out a Swedish built Tumbler (it was built by a guy called Leif Garvin), and I was not disappointed. I don´t have too much information but I can see on the net that it took Leif three years and 20.000 working hours to build the car. I took these particular snapshots before “Batman himself” arrived and posed for pictures, so I avoided the rush and the excitement initially, but captured some of that as well for the archives. It feels good to be alive right now. My holiday begins on June 6 and by then I should have RETROFUTURE 6 (rock edition, with Deep Purple MK4 on the cover) in from the printers. Here is a preview of the first spread in the magazine, most of the images has been shot by my longtime friend Michael Johansson. 100 copies will be shipped to the States (see earlier post) and 800 will be distributed for free in my neck of the woods in the next six months or so. The main magazine (western cover) will follow in October, and 900 out of a 1000 will be handed out and distributed in different ways ending on my 2014 holiday I think. It´s the beginning of the end for this hobby of mine. And a celebration (there will be a party with Deep Purple as the soundtrack). This weekend seems promising too, starting off with a Car Exhibition in Östersund which will give me a chance to see and photograph a Batmobile (good fun I would say), and on Sunday I will see Michael Schenker in concert in Sundsvall in the good company of old friends. As for the holiday, I am gearing up with some good DVD´s as well. There will be rainy days (this is Sweden). The second season of Spartacus, the final six episodes of Columbo (starring Peter Falk), etc. I have more episodes of High Chaparral to see and I will definitely be buying some more goodies in the coming days. An impressive pile of books (of all kinds) awaits my full attention as well. I will have a summer jam packed with cultural bliss, in all shapes and forms. Yes, I am a happy geezer. 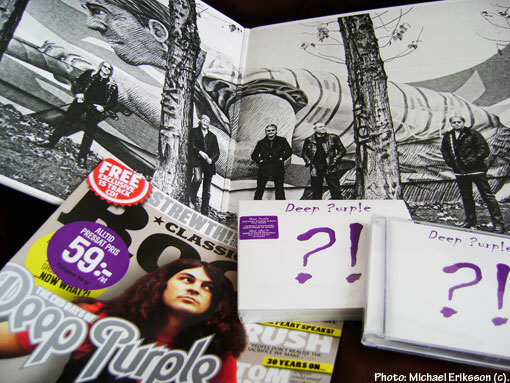 And on top of all this – I can´t stop listening to the new Deep Purple album. They have really delivered quite a masterpiece this time. Seen here are two pocket books with cover art by W.G.L Bartsch (dating back to 1974 and 1973), the prominent artist from Denmark that were seen on hundreds and hundreds of covers in the 70´s and 80´s in Sweden (not least on westerns and adventure books). 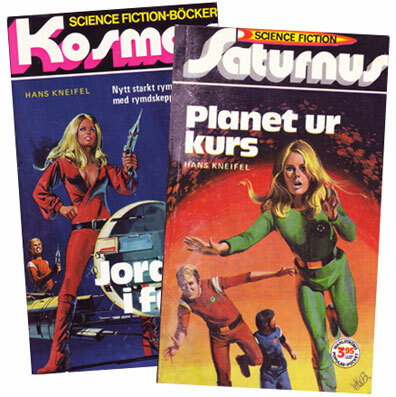 These titles, Kosmos and Saturnus, used to print Hans Kneifel´s Space Patrol Orion books, of which these are two examples. Bartsch supposedly used his wife, a model from France, for his covers. As you can see, they were better than most. 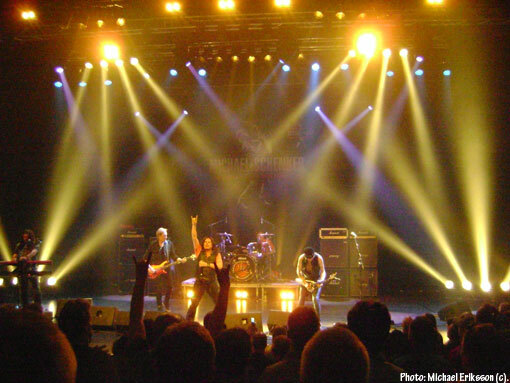 Deep Purple entered the Swedish charts at No.7 with their brand new “Now What? !” album this week, with very little visibility in our media (outside of Sweden Rock Magazine, see earlier post), so things are looking good. I think “Now What? 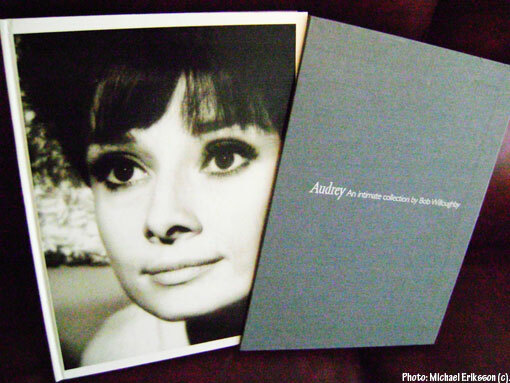 !” is an album that will sell by word of mouth. It should, it really is one of the strongest offerings from the band since the mid 70´s. This, their 19th album since 1968 (giving them a rather impressive 45 year track record) – third with this lineup – delivers big time. Producer Bob Ezrin (Kiss, Alice Cooper, Pink Floyd) has been a good addition to the family, and he does get credit as a song writer as well on this record. They split everything six ways. A strong indication that this collaboration will continue at some point. Deep Purple, sounding better than ever coming out of Nashville. Who would have known? Ian Gillan is 67 years old, but sings like a king. The trademark screaming is avoided, the more somber and mature in focus. His lyrics, sometimes in collaboration with Roger Glover, always entertaining. 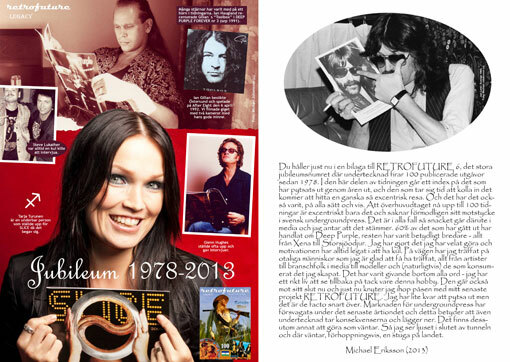 On this album he has found a new comfort zone that could well prolong both his career and the career of Deep Purple. He sounds great. Bob Ezrin has also been good in that he has got Deep Purple to utilize the live trademark on a studio record. That never happened before but here it is. Suddenly, the band moves into a furious pumping jam that brings the listener to surrender with a smile. It makes everything more interesting. The sudden break into a jam in “Aprés Vous” is a good example. Suddenly, it´s like being transported to “War Of The Worlds” territory. Ian Paice, Roger Glover, Steve Morse and Don Airey are great players. Don Airey steps forward on this record, producing sounds that takes Deep Purple into new territory. Some moments are bordering on early 70´s prog from masters like ELP, but I don´t mind one bit. Deep Purple is a beast from the 70´s, one of the last great bands of that era. If Purple wants to insert a few more shades of colours from those days into the mix, they have the right to do it. On tracks like “Above And Beyond” (inspired by the sad passing of Jon Lord last year) and “Uncommon Man” Deep Purple sounds fresh and powerful trading this new ground. In fact, I hope they explore this direction more in the future. Steve Morse will enter his third decade as a member of Deep Purple while promoting this record on the road. This is his fifth offering with the band and I think it is the best yet. His journey with the band has produced plenty of good material, strong enough to have launched a brand new band and built it from scratch to bigger things. With Purple, there is always the past to consider and I think that has been slightly unfair to Morse. However, history will acknowledge his importance to the second half of this bands history some day and records like “Now What? !” will assure that. Fans should be grateful that Deep Purple landed such a unique player when Ritchie Blackmore left. The fact that they are still here in 2013 with a killer album proves it. And the Morse/Airey pairing is another lucky accident in this bands history. The album ends with “Vincent Price”, which is going to be the next single (a video was shot in Berlin the other day). I think this song could very well bring in a brand new audience. Love the lyrics (see earlier post). This is a band that clearly love what they do, how else to explain a song like this? I loved it the first time I heard it, it made me smile. I have been a fan since 1971. I have followed the Purple Family ever since, through a turbulent but always interesting history. I have seen the highs and I have seen the lows. This is a high. Deep Purple are in a good place.